As a rule, I use a starting clamp for crosses on gut/poly hybrids and then go back and tie off the poly on a cross. With the Pure Aero this is not possible. The loop slots leave you no choice but to tie off on a main. I am wondering how others here handle this knot and I would especially be interested in hearing from anyone using a free floating knot (not actually tied to the anchor string, just floating freely in the tie off hole). I am thinking this is the best option but have zero experience doing it and have always considered it to be kind of taboo. I used to do the starting clamp method before, but I switched to using the starting knot as it allows you to put direct tension on the knot. Some client of mines preferred this method as the first cross is "tensioned" at the reference tension, despite what I tell them is the fact that first cross doesnt have a cross before it to make it the real tension. I find it a lot easier doing this method as I dont have to go back to the first cross and tension the string again just to clamp off and remove the starting clamp. 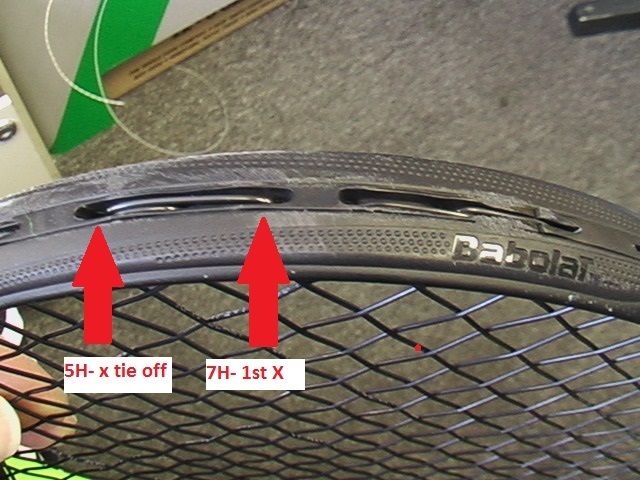 And you do this on the Pure Aero racquets with a gut/poly hybrid? There are only 2 holes in the slot, both occupied by mains. Are you comfortable tieing poly off on a natural gut main? I just had a racquet returned with the gut snapped at the tie off knot. I've never liked the idea of tieing off poly on gut mains and this is why. If someone requests 4 knots, they will get 2 finishing knots for the mains. And either a starting and finishing knot for crosses if the mains are not too fragile. If I have to use a fragile main, I will start the crosses like I would the mains. Then tension cross 1 and use a finishing knot. There really is no RIGHT way nor WRONG way to start crosses. It depends on the ref tension, grommet size and string gauge. I do not use a starting knot. Once I start crosses, I go back and tie off with finishing knot, and use the so called Parnell knot. I cinch up all my knots with fingers only. Also all gut strings, I place a small amount of a lubricant in each of the main grommet openings, as that has eliminated any early snapping of nat. gut strings, as I do string a decent amount of nat. gut. Use a VS Starting knot it was designed for gut anchor strings. Or an iKnot starting knot. If a customer asks for a gut/poly hybrid they are going to get 4 knots whether they like it or not. The crux of the problem for me is the knot itself. I am thinking on the Pure Aero of a bulky knot for a starting knot that is NOT tied to the main. It is a really large hole though and I've never thought to do this till now. I did a search on these 2 knots and watched your video. I would say that the knot I use is very, very, very similar to the iKnot. The iKnot is very similar to the VS Starting knot. I just push the tail up through the 2 loop to create more friction in the knot and the tag end lays better. Pushing that tag end up through the loops also makes cinching the knot easier even with a 15l textured poly string. @10shoe how is the starting knot you use tied? I use pliers to cinch up pretty much everything. I'd like to think I was gentle enough. Perhaps not. If you use pliers, then you should always pull in direction away from your face, like towards your shoulder. There have been cases where stringer used pliers and string snaps, or pliers slip and pliers goes into face or eye. There was a poster on these forums a number of years ago that posted a picture of his face after pliers slipped and hit him in face, so it does happen. I have used fingers only since I started stringing in 1968. We've been through this before Jim. My face after over 50,000 string jobs is older but unpunctured. I use a self cinching knot that is tightened like yours (in two stages). Very similar. But in the case of the Pure Aero it is tied after tensioning not before so I wouldn't necessarily call it a starting knot. I think of it as an all purpose knot. Do you have any experience with unanchored starting knots? EDIT: You could use a 6/0 seed bead and tie knot in the string after you put it through the seed bead. But I think that would put a lot of pressure on the grommet. I have only seen unanchored starting knots twice that I can recall. Both had badly mangled the grommet and one was about pulled half way through. I use the parnell knot for everything. It's neat and tidy, very effective in almost all scenarios, and I've never seen it damage a grommet. If I were doing gut and had to tie off on the gut I'd just cinch it up a bit loose. I've done that a couple of times before with poly and it works fine for me. I use that technique with overly mangled tie off holes too. If you don't pull the tail all the way tight it lays across the top of the grommet on both sides and prevents it from slipping in. Never had any issues, but use your own judgment. I wouldn't guarantee it will work well in every scenario. I also only hand tighten knots. I don't see a big need to pull them super tight usually. I think my loose parnell would probably not work with some of the super stretchy oil strings, but I haven't had to string one of those in a long time. I've seen knots untie themselves before with those oiled strings. Just looking at pictures it appears as though 9H is large enough for a tie off or is it just a flaired grommet hole? @10shoe - What diameter natural gut and poly will you be using? On nat gut or multi mains with poly crosses (especially when thin 1.10/15) - tube the main passing through the normal cross tie-off hole and leave sufficient tube length protruding inside the frame to tie-off the poly onto it. Works like a charm. And, I would explain to the customer why there is tubing. I've seen a guy file down the plastic channel in the grommets to get it over to do gut on gut. If I remember correctly, this is one of the few frames that the Wilson team will break the gut/gut, poly/poly rule because standard design doesn't allow. Grommet size is not the issue. Problem is using 9H would leave a loop of string sitting outside the loop slots where it would be exposed to court abrasion. Now THAT is interesting! I think my unanchored starting knot is tame by comparison. Thanks! In this particular instance the customer provided Armour Pro !6 for the mains and RPM 17 for the crosses. Tubing a Pure Aero I think would raise the natural gut so high in the already incredibly shallow loop slots that it would defeat the purpose of tubing. I am going to experiment today with some unanchored starting knots. With poly, I am expecting that a single loop will be sufficient and I will feed the "tail" up into the hole for aesthetics if there is room. I string quite a bit of gut mains and ALU rough crosses and always use an iKnot and had a break near a knot. I also use the iKnot with Ashway ZX and never had a break. I think the chances of breaking the string with a finishing knot are much greater. I would also not use a floating knot because you loose the friction from the anchor string make the grommet and frame hole subject to much more stress. I'm completely with @jim e on this. Other than his lubricant idea, I follow the same procedure. I string gut/poly on this frame exactly as I would with other string types, and I've yet to ever have any issues (thus far) in tying the poly cross off on the gut main with a carefully tied Parnell finishing knot. BTW, in reading the suggestion by @jwocky, I thought that was a very clever solution (to protect the gut main from the cross tie-off). However, I do see your point about the incredibly shallow slots in the Pure Aero's bumper making his recommendation more difficult than on other frames. Seems like a very good idea to mentally file away for possible use on other frames (with a sufficiently deep bumper channel). into the grommet and certainly not untieing itself. on how comfortable I get with using them I could see myself using them quite a lot. In the pics below I tied a simple knot in the poly then pushed the "tail" of the knot into the grommet hole and pulled tension. It isn't incredibly ugly and I think it is entirely safe. I see no downside other than the minimal ugliness. I used to find having 3 knots at the head of a racquet displeasing aesthetically. I got over it. I can’t believe how many double half hitch knots I’ve pulled out of grommets. I do think turning the tag end back into the grommet will help a lot though. It looks like an unanchored knot would put more stress on the grommet, as when it is tie to an anchor string the anchor string takes some of the stress. 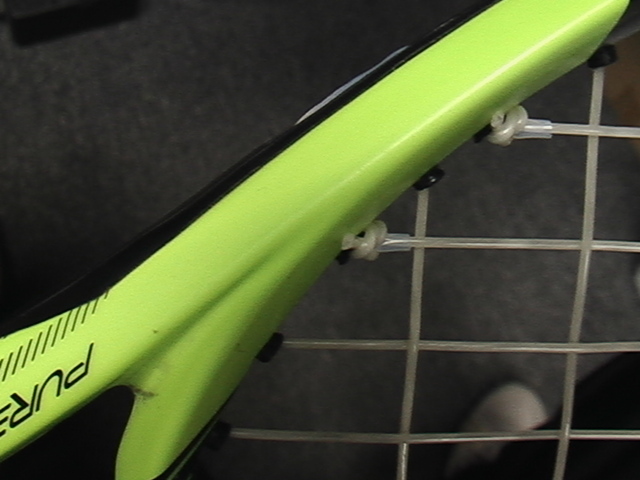 Especially on some racquets getting grommet sets are not easy with older racquets I would prefer to keep the grommets in best condition and not stress them out. I never had issue with gut poly hybrids. You still have to tie off the last poly cross to a gut main, as it would seem difficult to place an unanchored knot as a finishing knot without loosing tension. I would tie the poly to the gut and be done. You still have to tie off the last poly cross to a gut main, as it would seem difficult to place an unanchored knot as a finishing knot without loosing tension. True, but tubing holes in the lower half of the frame is not problematic. Only at the head. I'm pretty sure I've strung a pure aero 2 piece using a starting clamp on the outside of the frame to start the crosses and doing a normal wilson pro knot to tie off. Except that I don't use a Wilson pro knot (mine is like the iKnot) I'd say: "Me too". And 3 months later it came back with the natural gut snapped where I tied my knot at 5RH. It's certainly possible the customer sheared it but going forward I am going to go with a floating knot. Any kind of finishing knot will put more strain on the anchor string and the tie off string than a starting knot will. Long ago I had a gut anchor string break where I had tied a finishing knot, but I have never had any string break when I used a starting knot (regular or iKnot) for the top cross. That being said if you like your floating knot use it I don't see anything wrong with it and hope it works for you. A long time ago I read an interview with Lucien Noguès and I liked a lot of the concepts he used on the Babolat Stringing Team. Have no idea if they are still used today or not but a couple of the concepts were to use 2 piece stringing and never use a starting clamp on the outside of the frame. I'll have to see if I can still find that interview. I'm not saying anyone should use his suggestions but if you're going to emulate someone Lucien Noguès is not a bad stringer to emulate.